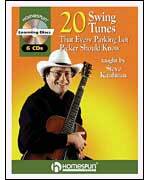 As he has done in the past, Steve has constructed these lessons according to his unique method: A beginner’s version in which he teaches the basic melody; an intermediate arrangement that will give your playing a solid grounding; and finally a full-blown solo that any swing guitarist would be proud to perform. As an extra training tool, special backup tracks feature Steve’s band swinging the rhythm in the right speaker while the lead is heard playing in the left. This will make for productive and exciting practice sessions. Once you have learned the tune at any of the three levels, these backup tracks will get you ready for jamming with other players. Here are the great tunes you’ll soon be playing: "After You’ve Gone," "Back Home Again in Indiana," "Blue Moon," "Danny Boy," "Georgia on My Mind," "Honeysuckle Rose," "I Got Rhythm," "Kansas City Kitty," "Lady Be Good," "Lime House Blues," "Little Rock Getaway," "Minor Swing," "Miss Molly," "Panhandle Rag," "It’s Only a Paper Moon," "Remington’s Ride," "Over the Rainbow," "Sugar Foot Rag," "Summertime," "The Sunny Side of the Street."